If the U.S. Fish and Wildlife Service moves forward with its plan to take the gray wolf off the Endangered Species list, it may be bad news for wolves around the country, but California wolves will still be protected under state environmental laws. Federal wildlife officials say delisting the wolf would free up resources for other endangered species. The Fish and Wildlife Service announced the plan Thursday. Asserting in a press release that the wolf now "roams free in nine states and is stable and healthy throughout its current range," the agency said the revitalization of the species "constitutes one of the greatest comebacks for an animal in U.S. conservation history." The gray wolf received federal endangered species protections in 1975, when only about 1,000 of them remained in northern Minnesota. Now more than 5,000 of the animals live in the lower 48 states. Over the years, the federal government's attempts to delist the wolves in some parts of the country, a response to ranchers worried about their cows and sheep becoming prey, became the subject of back-and-forth legal battles. U.S. Fish and Wildlife intends to make a final decision on lifting protections after a public comment period running through May 14. In California, state biologists say six wolves with radio tracking collars now rove the sparsely populated corners of Lassen and Plumas counties. Other, uncollared wolves have wandered as far south as Nevada County . The state's wolf management plan estimates that Northern California, not including the Sierra, a habitat conducive to the species, could support up to 500 wolves. California didn’t have any wolves to protect between 1924, when the last wild gray wolf was killed, and 2011, when a lone wolf from Oregon entered Siskiyou County in search of new territory. Biologists designated the male OR-7. Endangered species activists called him “Journey.” His fans even set up a Twitter account for him. In California, he found a mate, sired five pups and became the leader of a pack before migrating back to Oregon and fathering even more offspring. The battery in his GPS collar died in 2015, but Oregon biologists have tracked his activity since then. 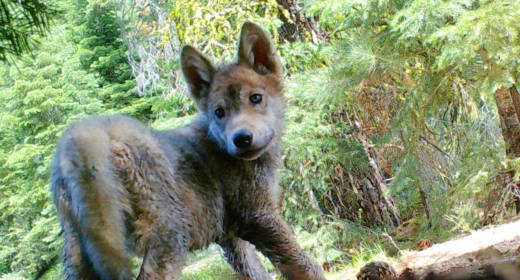 Last month, the Sacramento Bee reported that an entire California-born pack mysteriously went missing in remote Siskiyou County late last year. Wildlife biologists weren’t able to trap and collar the parent wolves or their five pups before they disappeared. The California Department of Fish and Wildlife is also investigating the death of a collared yearling male from Oregon. In 2014, the California Fish and Game Commission granted the gray wolf protection under the state's Endangered Species Act. That action became the subject of a lawsuit by the Pacific Legal Foundation, the California Farm Bureau Federation and the California Cattlemen's Association. The groups argued that an unchecked population of wolves would kill deer and valuable cattle. In January, a San Diego judge ruled against the farmers and ranchers and found even wolves wandering in from neighboring states should be protected by California’s laws. Weiss says it’s a “miracle” that wolves are coming back to California and thriving. She credits the federal protections they received under federal law. The group's president, Zippy Duvall, said, “Populations have far surpassed the recovery thresholds set forth by recovery plans, but too many environmentalists fail to recognize this success."